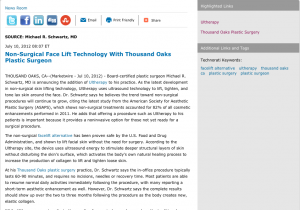 Thousand Oaks, CA ‒ Board-certified plastic surgeon Michael R. Schwartz, MD is announcing the addition of Ultherapy to his practice. As the latest development in non-surgical skin lifting technology, Ultherapy uses ultrasound technology to lift, tighten, and tone lax skin around the face. Dr. Schwartz says he believes the trend toward non-surgical procedures will continue to grow, citing the latest study from the American Society for Aesthetic Plastic Surgery (ASAPS), which shows non-surgical treatments accounted for 82% of all cosmetic enhancements performed in 2011. He adds that offering a procedure such as Ultherapy to his patients is important because it provides a noninvasive option for those not yet ready for a surgical procedure. The non-surgical facelift alternative has been proven safe by the U.S. Food and Drug Administration, and shown to lift facial skin without the need for surgery. According to the Ultherapy site, the device uses ultrasound energy to stimulate deeper structural layers of skin without disturbing the skin’s surface, which activates the body’s own natural healing process to increase the production of collagen to lift and tighten loose skin. At his Thousand Oaks plastic surgery practice, Dr. Schwartz says the in-office procedure typically lasts 60-90 minutes, and requires no incisions, needles or recovery time. Most patients are able to resume normal daily activities immediately following the procedure, with many reporting a short-term aesthetic enhancement as well. However, Dr. Schwartz says the complete results should show up over the two to three months following the procedure as the body creates new, elastic collagen. While Ultherapy cannot replicate the results of a surgical procedure such as the traditional facelift, the Thousand Oaks plastic surgeon says Ultherapy is extremely effective, and provides a viable option for those patients not ready for a surgical procedure, those that may not have the necessary downtime, or those that only need a subtle rejuvenation. Regardless of their reasons for pursuing a cosmetic enhancement, Dr. Schwartz says consulting with a board-certified plastic surgeon is essential to receiving the safest and most effective results because of the experience and expertise gained during the certification process. After earning his medical degree from the Baylor College of Medicine, Dr. Michael Schwartz completed his general surgery training at the University of Southern California, and his plastic and reconstructive training at the University of Texas Southwestern Medical Center. He is double board-certified by the American Board of Plastic Surgery and the American Board of Surgery. Dr. Schwartz is a Fellow of the American College of Surgeons, and a member of the American Society for Aesthetic Plastic Surgery, the American Society of Plastic Surgeons, and the Los Angeles Society of Plastic Surgeons. Dr. Michael Schwartz’s practice is located at 696 Hampshire Road Suite 210, Westlake Village, CA 91361, and can be reached at (805) 435-8256. Dr. Schwartz and his team can also be found online at drschwartz.com and their Thousand Oaks Plastic Surgery Facebook page.